Waco Hippodrome, Deep in the Heart Film Festival venue. A big shout out to Samuel Thomas and Louis Hunter, Co-Directors of the Deep in the Heart Film Festival, for putting together a wonderful festival experience. I can’t wait to return next year. Now even though the “Priyanath” film festival days are over, you may still be able to catch the film at theaters around the world as part of the Women in Film and Television Film (WIFTI) Showcase. Yep! We are super excited to report that the film was selected amongst numerous other film submissions to represent the work of women filmmakers around the world. We are honored to be a part of this amazing showcase. ​Some of you may know the film “Priyanath” was inspired by a story found within the spiritual classic “Autobiography of a Yogi” written by Paramahansa Yogananda. Published in 1946, the book has sold millions of copies, been translated into forty-eight languages and inspired countless individuals worldwide. I find myself continually inspired by the book and the Kriya Yoga teachings of Paramahansa Yogananda. 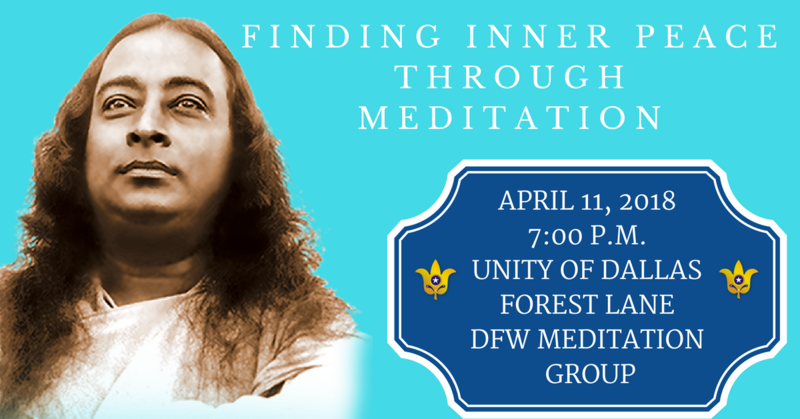 I invite you to come learn more about the man and the teachings first hand at the free lecture and meditation event “Finding Peace Through Meditation” held at 7pm, Wednesday, April 11th at Unity of Dallas. Feel free to bring a friend. All are welcome to attend! Learn more at www.meditationevent.com. I’m super excited to be working on a new short film called Priyanath. It’s the story of six-year old, Priyanath, an adventurous, mischievous boy who imagines himself to be a superhero taking down imaginary villains with his extraordinary powers. But when Priyanath learns of a real danger near his home, he has to decide if he’s actually got what it takes to be a real life superhero! 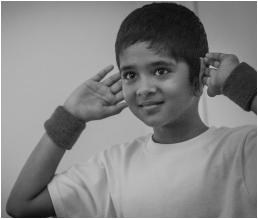 Although Priyanath (played by Likith Yalam) likes to imagine himself as an international superhero, like most six year-olds, he spends most of his time at home. In the film, the kitchen is the central place where the story begins to unfold. In one of the main scenes, Priyanath climbs up into a chair and doodles while his mother, Kadambini, (played by Krishna Smitha) prepares a meal for her family. We spent a lot of time in the kitchen on this production and bringing authenticity to the kitchen scene was highly important. I wanted it to look like Kadambini was actually cooking dinner. And I wanted to create a visual feast for the audience so that they could actually taste and smell the fragrant spices of a delicious, Indian meal. So, what did we do? We brought in lots of food! 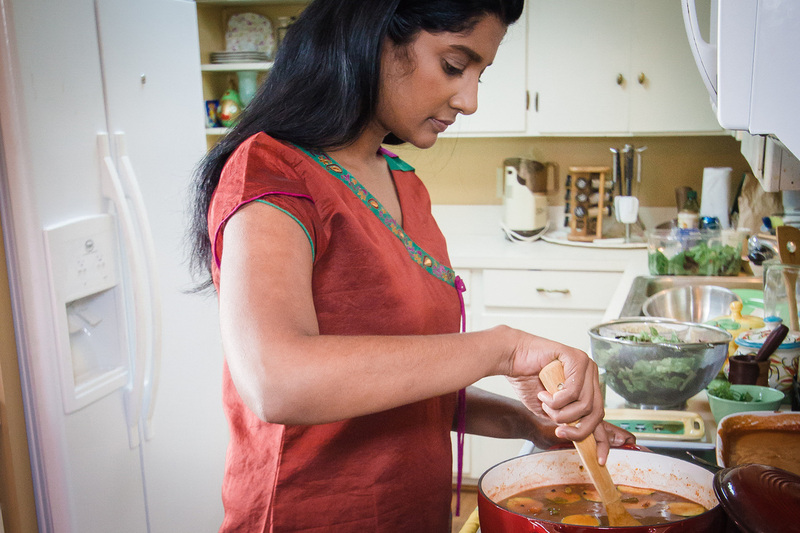 After all, what’s more authentic to a kitchen than food? Script Supervisor Debra Wallace-Washington takes photos for continuity while Likith doodles and DP Joe Norman sets up a shot. 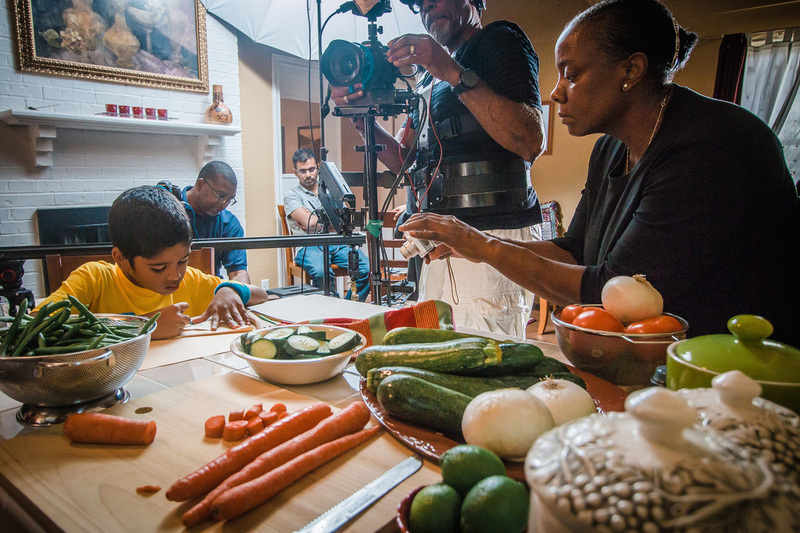 As you can see in the production stills, we had lots of food, especially fresh produce on set. Zucchini, carrots, tomatoes, onions, green beans. These brightly colored, nutritious props added life, color and realism to our set and helped paint the picture of Priyanath’s family and their home. I enjoy working with props. And, for me, food props are especially fun. It’s like cooking for guests without having to worry about how the food tastes. I get to have fun with the colors and textures of the food without needing to focus on the flavors. The Priyanath film crew was a small one so several of us did double and even triple job duties on the film. And there were several “cooks” in the kitchen when it came to making food props. 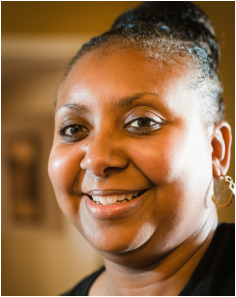 Our food prop team included Heidi Diederich, Debra Wallace-Washington, Samara Wesson and Chrisdya Houston. My good friend, Chrisdya, had volunteered to do craft service for the shoot which basically means she would make sure we were all well fed during the day. Little did she know, she was in for more than craft service that day! The night before our shoot, I had bought food for our kitchen scene. But once it was all laid out on the table the day of the shoot, we realized it wasn’t enough. So, flying into action like the superhero she is, Chrisdya (equipped with a grocery list from Debra) ran out to get us more. She came back with several bags of food, enough to make a real...well, real fake, delicious Indian meal. As Chrisdya and Samara unloaded the bags, I popped into the kitchen. I quickly said to them, “So, I need you ladies to make the prop food. If you could mix together a curry that would be great. And then I need you to make a soup in this big, red pot on the stove. 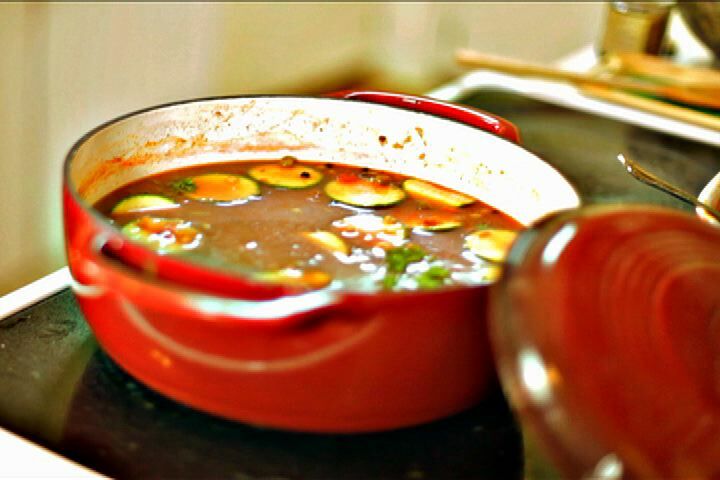 And it needs to look delicious because we’re going to be getting a shot of the soup simmering in the pot.” Chrisdya, sounding surprised, replied, “You want us to make the prop food?” I wish I had a picture of Chrisdya’s face in that moment. She had been thrown into the bowels of low budget, indie filmmaking and I think this was the very moment she realized it. There was nothing I could do to save her at that moment. It was too late. We were all in it together. I replied, “Yep. Just start chopping up the vegetables and throwing stuff in. You’ll figure it out. Alright, I gotta go.” With that, I swiftly left them and headed back to the bedroom where we were still shooting. I can only imagine Chrisdya was left thinking, “What did I get myself into?” But I don’t worry about that. We’ve been friends too long for her dump me. Charged with the task of making prop food, my fifteen year-old cousin, Samara (being the millennial that she is) quickly took to the Internet looking for pictures of Indian curry dishes and soups. She then instituted a prop food making process she called “chop, shove and stir.” By the time I came back into the kitchen, she and Chrisdya had finished the curry and were stirring and cooking a great looking pot of soup made with cans of Campbell’s soup, beans, potatoes, spaghetti sauce and fresh vegetables. And, for a prop soup, I must admit, it smelled pretty good. They just laughed and carried away their bags of prop soup, paying me no mind. One of the things I love most about filmmaking is the collaboration. I love how each person brings their talents and skills to a project, making it better than a singular person’s efforts alone. I often compare the art of filmmaking (and theatrical productions) to making soup. Everyone adds something different, spicy, creative and exciting to the pot. And what we end up with is a unique, cohesive piece of art. As artists, we hope that our piece of art is brilliant, stunning or good at the very least. And when it is finished, everyone who helped create that piece of art walks away with a tangible or intangible piece of it. Looking back, I can’t help but feel that our pot of prop soup is its own character in our film. We envisioned it, bought its ingredients, chopped them, stirred it and simmered it. It even got a nice close-up shot which will be included in the film. And at the end of the day, when all was said and done, some of us took it home. I won’t soon forget that pot of prop soup. And if I do, I’ve got a prop soup burn mark in the bottom of that big, red pot to help me remember! Chrisdya Houston, craft service and props. You can learn more about the film, the inspiration behind it and get a sneak peek of footage from the film by visiting our Indiegogo campaign page at http://igg.me/at/priyanath. We're raising funds to finish the film on Indiegogo.com. We'd love your support! And please spread the word. Thank you! Hello, Everyone! We have exciting news to share. This Wednesday, we launched the Indiegogo fundraising campaign for the short film Priyanath. This is a fun, family film about a six year-old boy named Priyanath who imagines himself to be a superhero taking down imaginary villains with his extraordinary powers. Fighting pretend bad guys is easy. But when he learns of a real danger near his home, Priyanath must decide if he’s actually got what it takes to be a real life superhero! I am the writer/producer/director of this film. It's a true passion project and I can't wait to share it with you! The film stars Krishna Smitha, Ram Lakkoju and Likith Yalam as Priyanath. 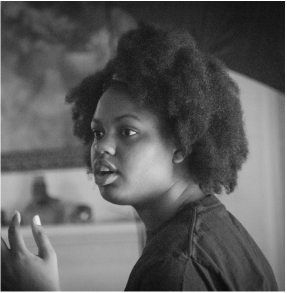 You can learn more about the film, the inspiration behind it AND get a sneak peek of footage from the film by visiting our Indiegogo campaign page at http://igg.me/at/priyanath. We began shooting the film at the end of the summer and are close to finishing production. But we need your help to get us to the finish line! We've started a campaign on the Indiegogo website and are committed to raising $7,000 by December 24th! That's not a lot of time, but we know we can do it with help from superheroes like yourself. Here's how you can help. Donate to our campaign online through Indiegogo. Click this Priyanath Indiegogo campaign link ﻿﻿ to get started. Spread the word to everyone you know - friends, family, colleagues, pen pals, you name it. Here are some ways to do it! Get social. View the campaign and share it on social media. Go retro. Tell others about the campaign over the phone or in person. Please click this link, http://igg.me/at/priyanath, to view our Indiegogo campaign page. There you'll see our fundraising video, learn about our fantastic cast and crew and, of course, you can make a donation to help bring this film to life. When you donate, you become our superhero and we've got some exciting perks to send your way! We're giving away DVDs of the film, the film soundtrack, posters, T-shirts and more. We'd really love your support! And we thank you in advance for viewing our campaign! Likith smiles for a photo while taking a break on set. Cast members Krishna Smitha and Ram Lakkoju pose for a picture with Tracey Hill (hair/make-up and wardrobe. Krishna Smitha (left), Tracey Hill (center), Ram Lakkoju (right). 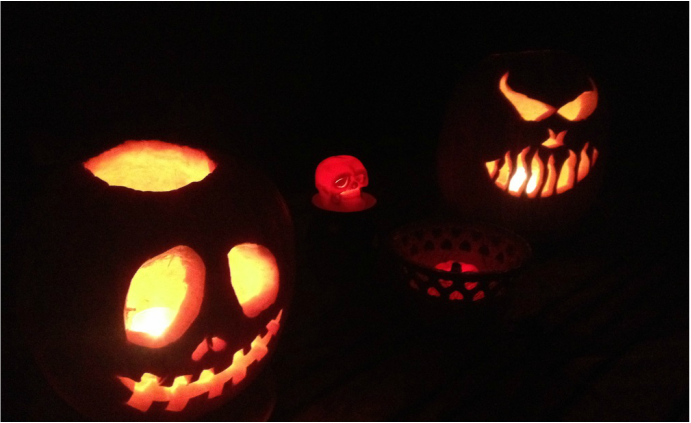 Family pumpkins carved October 2014. Ghouls, ghosts and goblins! We have arrived at one of my favorite days of the year - Halloween! In anticipation of this fabulous, spooky, fun holiday, I’ve decorated the house with ghosts, spiders and their webs, dismembered body parts, monsters and bats flying overhead. What can I say? I’m excited like a kid ready to knock door-to-door for delicious, sugary treats. I’m already well into my Halloween celebration. This past Sunday, I threw my family’s traditional Halloween party, an event I’ve taken over for my dearly departed mother who always found so much joy in throwing family dinners and get togethers, including our annual Halloween party. Over the years, our family has celebrated the holiday with storytelling, games, pumpkin carving competitions, scary movies, trick-o-treating and lots of good food and sweet treats. I suppose one of the reasons I love Halloween is that it’s filled with family and fun. But I also love Halloween because it’s the one day of the year you can be whatever you choose to be. A day of dress up when you can don a costume or mask and be free of gender, race and age and, therefore, the preconceived notions of others based upon them. And isn’t it just fun to play dress up? To imagine yourself to be stronger, braver, wilder, wackier, more famous, more powerful, more super than you already are? Or maybe you’re the type who likes to dip into the dark side and explore the menacing and macabre, dressing up as something wicked, undead or down-right terrifying. With a plethora of superhero and zombie films ruling the box office over the past several years, superhero and zombie Halloween costumes are as popular as ever. Now, dragging my undead body around trying to avoid a Zombieland double tap doesn’t sound nearly as fun as having superhuman, physics-defying, superpowers and saving the world. That said, I’d choose being a superhero over a zombie any day. Actually, I love superheroes and long for superpowers so much that I began producing and directing a superhero short film titled Priyanath this fall. A production still from the short film "Priyanath" starring Likith Yalam. The film stars Likith Yalam who plays six year-old Priyanath, a boy who imagines himself to be a superhero taking down imaginary villains with his extraordinary powers. Fighting pretend bad guys is easy. But when Priyanath learns of a real danger near his home, he must decide if he’s actually got what it takes to be a real life superhero. And one ominous night will determine his fate. Will young Priyanath become a hero or fall victim to the danger around him? Well, you’ll have to wait to see the film to find out! Inspired by true events, Priyanath is a thrilling, superhero tale, embodying the spirit of youth and fearlessness. It’s been a blast working on the film. We’ve have a talented crew of professionals and an outstanding cast to bring this film to life. Our cast includes Krishna Smitha and Ram Lakkoju who star alongside our young star Likith Yalam. Working with Likith and dressing him up as a superhero reminded me a lot of Halloween. We got to play and use our imaginations to create our own little world. And it’s been a lot of fun. I guess one of the best things about filmmaking is that it’s a lot like Halloween, full of costumes, make-up and characters; and sometimes it’s scary too! Family pumpkins carved in 2013. Anietie Antia-Obong is the founder of Shaken World Screenworks, the go-to, full service, video production company for the world’s the movers, shakers, innovators, activists, entrepreneurs, visionaries and other wavemakers. Find out more at www.shakenworld.com. Anietie is a producer, director and a writer who is excited to finally begin the journey of blogging. Check back later for more posts.